Brian Burns, from the Amy Winehouse Foundation and Addaction, who gave an inspirational talk to students and held a series of workshops at Somercotes Academy. With him are Year 10 students: (L-r) James Haile, Louie Hawkins-Ney, Hayley Borland, Katie Lester, Connor Wilson and Ellie Gowling. 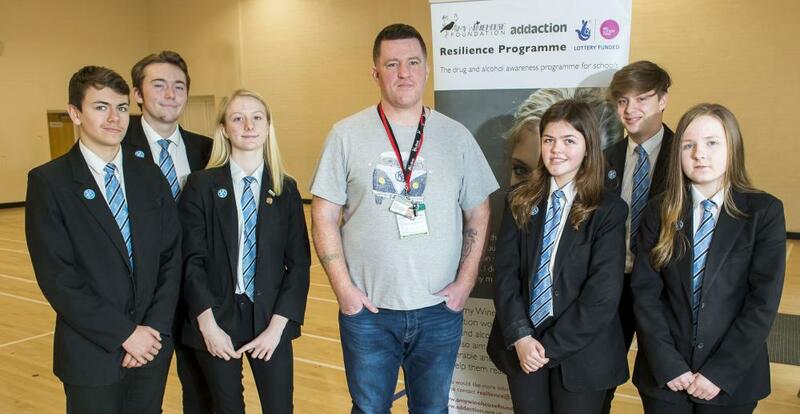 A man who lost 23 years of his life to drug addiction is using his experiences to help vulnerable young people in schools throughout Lincolnshire. Brian Burns, who now lives in the county, works for The Amy Winehouse Foundation. He visited Somercotes Academy to talk to students as part of the Addaction Resilience Programme. The two organisations are working to prevent the effects of drug and alcohol misuse on young people. They also aim to support, inform and inspire vulnerable and disadvantaged young people to help them reach their full potential. After his talk, Brian held a series of workshops with students in smaller groups focusing on self-esteem. The talks were very well received by Somercotes Academy students. James Haile said; "Brian talked about risky behaviour, peer pressure, low self esteem, and drugs and alcohol. He told us about having good friends, and losing the bad ones. He also told us about charities to contact if you have family or friends who are substance abusers." Hayley Borland said: "It was very interesting and honest to hear someone's real life story."